By now everyone knows that the N had an accident with a Prius at Judah and 17th. 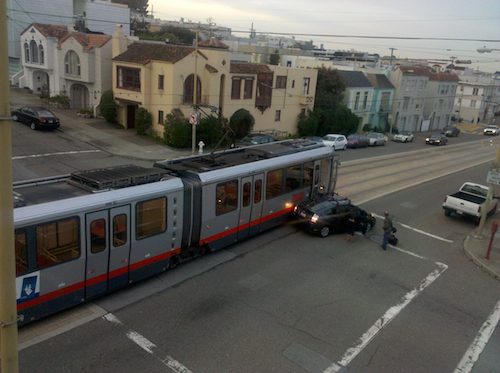 From a few eyewitness accounts, it seems the Prius decided to roll through the street intersection without paying attention, and the result was an accident where no one was hurt, but now we have an N Judah train and a car to fix. This is becoming more and more common, as drivers of cars seem to think that streetcars can stop on a dime all of the sudden, or simply don’t pay attention when rolling through an intersection, stop sign or not. This is the same reason we’re having so many cars get hit at 8th and Irving also – people are simply not paying attention to the traffic, even though there are multi-ton vehicles rolling on the streets, not to mention other cars, cyclists, pedestrians, etc. Too bad we can’t have some sort of test that would assess whether one is qualified to drive a vehicle, then issue a document they could carry indicating they’d passed said test. Maybe that might help. People really don’t taking driving seriously enough. The idea that one can talk on the phone, text, read email, listen to political talk, etc. while command a vehicle is ludicrous, especially in urban traffic conditions. Even paying full attention, it is hard to see all the signs, pedestrians, cars and transit vehicles. @makfan: we’ve done a great job killing off driver’s ed in this state for years, cutting back on funds. Gov. Deukmejian’s crowning achievement in his last year in office was to withhold all funds as “punishment” to public schools. We also have a lot of transplants who grew up and learned to drive in places where you could drive like an idiot and not have any repercussions because they’re from rural or exurban areas where they’re not in a dense urban area. I’ve often thought that the test to drive in an urban area like LA or SF should be way more intense than the ones for rural areas. If we could actually ground all of the incompetent and clueless drivers, there would be no traffic jams. @Greg, You are right about driver education. I had an entire half year that included simulator and on street training in a school car. Those days are gone. I also realize your last paragraph is dripping with sarcasm. We have cut so much and the republicans are demanding more…sigh. @mad park – funny, but pretty accurate I’m afraid.